2017 ACA Annual Cashew Conference: A Success Story! “A new vision for partnerships and investments” – African Cashew Alliance’s 11th Annual Cashew Conference and Expo took place in Cotonou, Benin over a period of four days from the 18th to the 21st September 2017. The conference, organized with great support from the national cashew value chain association, IFA, and the Benin Government as well as other private sector partners was yet again, a great success! With 342 participants from 27 countries in attendance, the conference attracted diverse cashew value chain stakeholders who deliberated on pressing industry issues and discussed ways to foster development– industry expert speakers, sector-specific workshops, and over 106 business-to-business meetings provided both experienced industry players and first-time attendees with key information and tools to facilitate the continued development of the African cashew industry. The opening ceremony of the conference on 18th September welcomed high level speakers in the persons of the Ambassador Lucy Tamlyn, US Ambassador to Benin, H.E Mrs. Novissi Abaidoo, Ambassador of Ghana to Belgium and the Head of Mission to the European Union, Madame Yvonne Chileshe, Commodities expert from the Secretariat of the ACP group, Mr. Adama Coulibaly, Managing Director of the Cashew and Cotton Board or Cote d’Ivoire (CCA), Mr. Florentino Nanque, the President of ACA, H.E Delphin Koudande, Minister of Agriculture, livestock and Fisheries, H.E. Lazare Sehoueto, Minister of Trade and Industry of Benin and H.E. Abdoulaye Bio Tchane, Minister of State in Charge of Plan and Development and other important private sector partners from the Competitive Cashew Initiaive (ComCashew), Fludor Benin, Olam and Benin Caju. Participants had the opportunity to learn from 46 speakers and moderators in plenary panels, special forums and workshops on topics ranging from innovations in cashew Production, rethinking cashew processing in Africa, to Understanding cashew market information, sector organization and cashew investment financing. The 2017 general assembly was well attended with ACA members agreeing and approving the new strategic direction for the Alliance, under the new vision “a sustainable African Cashew Industry that delivers globally competitive valued added products and secures profitability for all actors” .The session ended with Executive Committee elections that replaced and re-instated some members of the ACA Executive Committee. Mr. Wayne Tilton from Red River foods as well as Mr. Wim Schipper from Intersnack were the new members who added to the committee, representing the international seats. A highlight of this year’s conference was the finalization of a vision for the African Cashew industry, hence, the conference theme, that will put the focus of all stakeholders in the same direction for developing the sector. This vision casting exercise started in a stakeholder forum in Accra earlier this year and was concluded at the just ended conferenced. Mr. Ernest Mintah, Managing Director of ACA moderated a whole session with experts from different aspects of the cashew value chain deliberating on the vision. At the end of the session, this vision “to create wealth for all actors in the value chain by locally transforming all African Cashew competitively and sustainably, supplying traceable Cashew kernels and by-products to export and domestic markets” was accepted by all present as the way to go for the development of the cashew industry in Africa for the next 10 years. Another highlight was the round table sessions between private and public sector actors. This was the first of such an opportunity created for private sector actors to speak face to face with policy makers on the main issues affecting profitability and development of the industry. Following these round table discussions, a declaration by the private sector, through the ACA was signed and presented to the council of ministers of the international Cashew Council (CICC), during their meeting from 28th to the 29th September, 2017 in Abidjan, Cote d’Ivoire, for their commitment to support the cashew industry and take the right decisions towards its development. During this meeting, ACA, representing the private sector voice advocated for the development of the sector through the promotion of value addition in Africa. A total of 10 countries were represented, including 6 from West Africa - Benin, Burkina Faso, Cameroon, Côte d'Ivoire, Ghana, Guinea Bissau, Mali, Mozambique and Senegal and a representative from ECOWAS. The Technical and Financial Partners represented by the Competitive Cashew Initiative (ComCahew) made a declaration to support the efforts of the CICC at the level of the member countries. A special cashew women’s breakfast meeting was held as part of this year’s conference on the 20th September. This is an initiative of ‘cashew info’ with the support of other partners including the ACA to highlight women ‘ground breakers’ in the cashew industry for their laudable efforts. It is also to encourage other women in the business not to give up in the tough business of cashew but to strive for success. A special publication on ‘Cashew Women Entrepreneurs’ in the cashew industry worldwide was launched. The publication showcases influential women in the industry and their stories. The conference officially ended on the evening of the 20th September with a closing speech by the Minister of Agriculture, Livestock and Fisheries of Benin, H.E. Delphin Koudande. The 12th annual cashew conference location was announced to be Abidjan, Cote d’Ivoire! Finally attendees travelled beyond Cotonou on organized field trips to see two key aspects of Benin’s cashew value chain - production and processing. Some field trip participants visited a cashew plantation in Dassa, a model farm that had undergone training with the Technoserve project, Benin Caju, on grafting and intercropping to increase productivity, while others visited Fludor, a world class cashew processing factory designed to meet the highest international standards of processing. 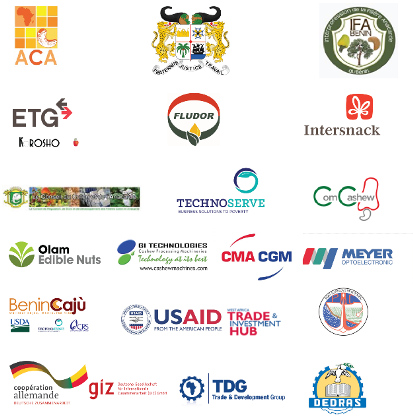 With the successful organization of the 11th Annual Cashew Conference and still counting, the ACA is most grateful to the host country, Benin, and local host, IFA, our sponsors and key partners – Intersnack, ETG, Fludor Benin, USAID, ComCashew, Technoserve, CCA, Olam, GI Technologies, Meyer, CMA CGM, GIZ, Dedras ONG, BeninCajù, Port Autonome and TDG, media partners, speakers, moderators, facilitators, organizing committee, ACA Secretariat and all participants for the support! The full list of conference participants can be found here.